It is a face lift conducted without surgery, so without surgery or down time, which is mainly carried out using hyaluronic acid. Tensile threads and lasers can further improve the result. The aim of a medical or ‘liquid facelift’ is to rejuvenate the patient, and not to change their face. In the past, hyaluronic acid was used in dermatological surface treatments, with short-term results. Today, hyaluronic acid isn’t just used for wrinkles, but is injected at depth to restore volume. The new style of injection is based on surgical concepts, and the results are long lasting. – Ptosis ( descent of facial tissues ). – Changes to facial shape. – To combat the appearance of tiredness or a ‘sad’ face ( due mainly to the appearance of bitterness folds and downwards movement of the labial commissure ). – Appearance of deep lines and folds, naso-labial lines, and under eye circles. The result is immediate, and you can go straight back to your daily activities. There is no real ideal age. 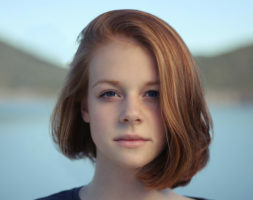 In my experience, the first signs of ageing ( facial ptosis ) appear around 25, but it all depends on the anatomy and shape of the face (long or round face, the amount of facial fat ) and the person’s daily life ( for example weight loss ). The 8 Points Face Lift is a technique invented by a Brazilian plastic surgeon, Docteur Di Maio, which uses hyaluronic acid to redefine and subtly improve facial features. This treatment rejuvenates the face, and restores its volumes, proportions and symmetry. It targets precise areas of the face, with each point considered in relation to the other, and contributing to overall improvement. Aesthetic medicine prevents the fall of facial tissues, and delays, and in certain cases avoids (especially for long faces) the need for surgery. 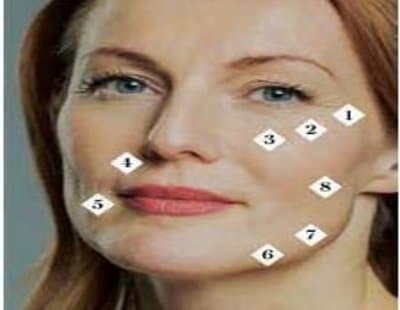 Your doctor will suggest the best solution after analysis of your face. 8 points are targeted in order to restructure the volumes and to lift the face. These points are tailored to each patient (according to need, the presence of bags, and level of lymphatic drainage). The injection zones are chosen according to the anatomy. The dual-level strategy uses deep injections (in contact with the bone), and then injections nearer the surface in the subcutaneous fat. – The under-eye circles (point 3 on the above image). – The naso-labial lines (point 4 on the above image). – The cheeks and cheekbones (points 1, 2 and 8 on the above image). – The edge of the lips or labial commissure (point 5 on the above image). – The jaw line (points 6 and 7 on the above image). Side effects are minimal. Rare swelling and bruising are temporary. If poorly carried out, this can give unnatural results, weighing down the face, and thus changing it. Deep injections must be carried out by an experienced doctor who is an expert in facial anatomy. I seem much younger while being natural. Doctor Romano used the medical lifting technique with hyaluronic acid injections on my face. The result is impressive. The injections give an immediate result and are very natural. My face has been lifted, I look rested. My face was drooping following a weight loss. Doctor Romano did hyaluronic acid injections and restored my face. The result is beautiful and natural. A friend has a medical lift with hyaluronic acid with Doctor Romano. The result was stunning, so I came to see this doctor. I gained 10 years. Thank you Doctor Romano.